You can Playback either Market Replay data or historical tick data. For the most accurate reflection of live market conditions you would want to use Market Replay data. 1.Market Replay data holds the exact sequence level I and Level II (market depth) data and must be recorded or downloaded by NinjaTrader. 2.Alternatively, historical tick data can be used to playback chart data (without market depth). The granularity and accuracy of historical mode will be dependent on your data provider. 3.The Playback101 account properties (e.g., Commissions, Risk, etc.) are created from the Sim101 account when connecting to the Playback Connection and cannot be reset while connected. The Playback101 account will reset with current Sim101 account properties when reconnecting. 4.It is recommended to close and save your live workspaces then use dedicated workspaces for Playback before connecting to Playback to ensure items, such as drawing objects, are not affected in your live workspaces. 1.Left mouse click on the Tools menu and select the menu item Options. 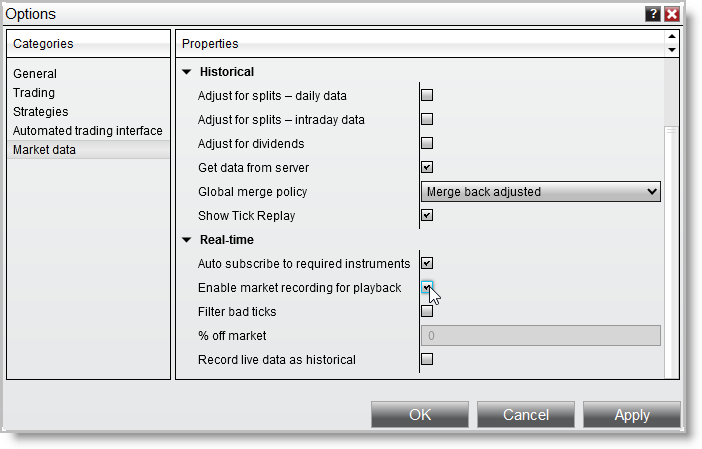 2.In the Market Data category enable the option "Enable market recording for playback". Once Enable market recording for playback is enabled (see the "How to enable the market replay recorder" section above), data is recorded for any instrument in any NinjaTrader window that is receiving live market data. Level II (market depth) data is only recorded if a Level II, SuperDOM, or FX Pro window is open and receiving data for the instrument. The Market Analyzer window is the recommended recording window as multiple instruments can be added to one Market Analyzer window and all recorded at the same time. Market Replay data holds the exact sequence level I and Level II (market depth) data. NinjaTrader offers a limited amount of Market Replay data free to download for playback purposes. Only the most common instruments are currently available. 1.Enable market recording for playback must be disabled from the Market Data category of the Options menu before downloading replay data. 2.Downloading Market Replay data is NOT available when connected to the Playback connection. You must disconnect from Playback connection prior to downloading. 1.Select the Tools menu in the Control Center, select the menu item Historical Data and select "Load" tab. Here the section "Get Market Replay data" can be expanded. 2.Select the instrument and date of the desired replay data and press the OK button to begin the download. The status of the download will appear in the lower right hand corner of the Historical Data Window. Note: Closing the Historical Data Window will cancel the download. If Market Replay data is not available, or you do not need the accuracy that Market Replay data provides, you can optionally use playback using historical tick data offered from your data provider. You can download, export, import historical tick data via the Historical Data Window.